DO YOU SWEAT ... AND SWEAT ... AND KEEP ON SWEATING? NO PROBLEM ... we have MINVIT STAR for you!! Electrolytes are essential elements inside our system that regulate the distribution of water in the body, affect pH and promote neuromuscular stimulation. Especially in people who are training, electrolytes are extremely necessary for muscle contraction, heat dissipation from the body, temperature regulation, deep hydration and preservation of athletic performance. As with a car, that its battery must be fully charged and adequate in liquids in order to start it up, same goes for our body and muscular system too, since it must be full of liquids in order to function. 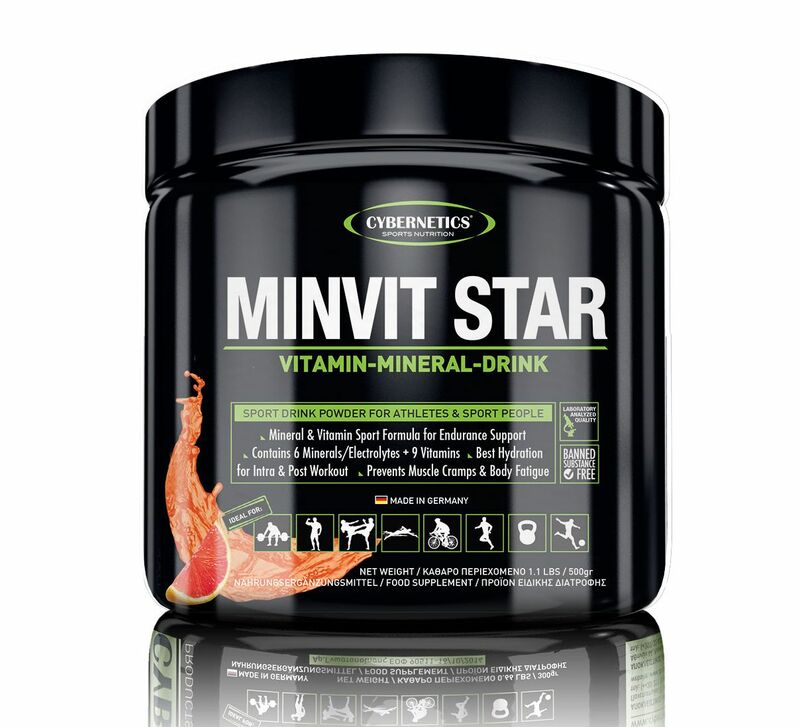 Cybernetics’ MINVIT STAR consists of a scientifically formulated mixture of carbohydrates and electrolytes that ensures optimal muscle contraction, increases hydration and strength, reduces fatigue, prevents exhaustion and the potentiality of dangerous issues such as dehydration and muscle cramps. With Cybernetics’ MINVIT STAR, the body is fully powered with precious electrolytes that immediately replace those lost in all kinds of activities, hard work and high temperatures. Its use is very simple: Mix 2 teaspoons (15g / 1 serving) into a glass of cold water and drink it before you train. You can also mix it with a shaker and drink it during your training session. If you do cycling, jogging, football or basketball etc. or you sweat too much consume 1 serving before and 1 other serving during halftime or immediately after the game or race. Mix 2 teaspoons (15g / 1 serving) into a glass of cold water and drink before training. You can also get back to a shaker and drink it during the training session. If you do cycling, jogging, football or basketball etc. or you sweat too much consume 1 serving before and 1 other serving at halftime or immediately after the game or race.